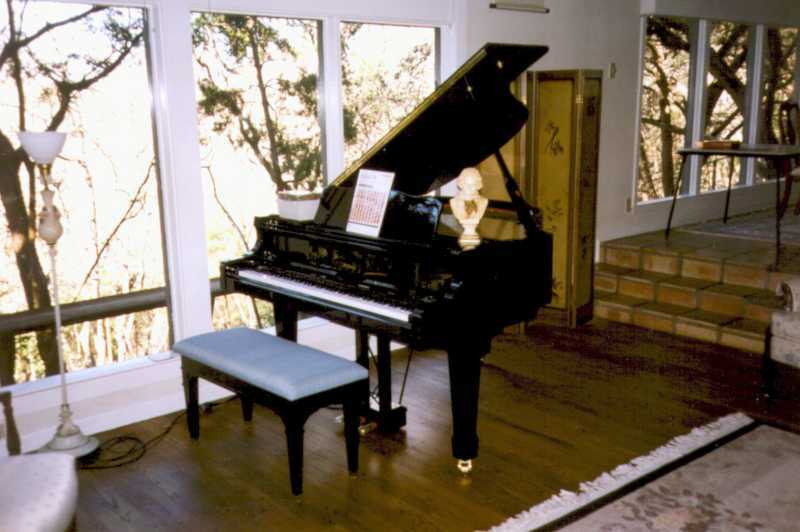 The piano in the photo above is the first Roland Digital Grand Piano to be imported into the US. One cannot believe the realism! Open the cover and explore a very, very unique instrument. What Roland has done here is to use the piano's sound board acoustically coupled with sound generated not by string vibrations but from audio speakers! I have never seen a piano like this one! By coupling the sound board with 12 positioned speakers (woofers, mid range speakers, and tweeters) the sounds actually emanate from the expected site where the strings are to be located! This is so new that there is not much on the Internet about the KR-1070. The only link I have found as of January 14, 1998 is a reference to a collaboration with one of the Roland Companies, Rodgers. If you are interested in this only release, click HERE. (see below for new information available as of December, 1999). I would really like to know if anyone out there on the Internet has more information on this magnificent instrument. It was love at first sight! I gave my 90 year old Baldwin Grand Piano to my son (hated to part with it, but nothing else but this Roland Grand Piano would have made me do so). The Roland KR-1070 has everything! It has a beautiful lacquered wood cabinet which is supreme grade furniture style. It has solid brass rollers. It has an ivory-like keyboard which, honestly, has an even better feel the touch than even the most expensive of grand pianos on the market today. You can adjust the touch to match one's preference. In an acoustical setting as shown above, this piano performs magnificently! The reverberation and brilliance controls can easily be adjusted to match this room when virtually empty, or with an audience of 30 or more people. I have a friend who has a very expensive Bosendorfer Grand Piano. Well, on the KR-1070, just click on Piano #2 (of six types) and you have this piano! 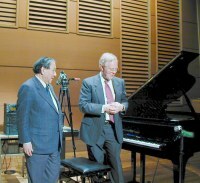 If you want to emulate a nine foot Steinway Concert Grand, just click on Piano # 1. I cannot overemphasize the realism of sounds and touch from the KR-1070 comparable to a concert grand piano costing many times more. In my opinion, this is one of the great inventions in the music world. My congratulations to Roland for the design, development, and implementation of a beautiful new instrument. As a sideline, I can say that this instrument is in use by everyone in my family! My wife is a violinist, and we downloaded some nice MIDI files of violin/piano music, and when this is played on the KR-1070, with the built-in in 16 track sequencer, one can use all tracks for initial accompaniment or remove the violin part and then my wife can play in place of the solo! If this works for the violin, it should be great for many other instruments! A great training aid! My daughter is an opera singer, so this is a wonderful help to her. She can bring her accompanist to our home, and as the pieces are practiced, they are recorded. Then my daughter can take the MIDI files to her home where she can practice! As a pianist, my son, David, really likes this instrument even though he now has my Baldwin grand piano. I truly enjoy having him play and record his pieces. It is like have a concert every night! Below is a diagram I have made from my observations of the 12 speakers on this instrument. Two centrally positioned speakers (blue) are coupled with bass reflex horns (orange). On either side of these speakers are two mid-range speakers (green), and forward toward the keyboard are two additional mid-range speakers (green). All of these speakers project downward, but obviously they vibrate the sounding board above. If one places one's hands on the board, it is distinctively vibrating. To achieve high pitch sounds, six high range (tweeters, red) are mounted in the sounding board itself and projecting upward. Thus, the twelve speaker system realistically delivers not only the correct sound patterns but also the stereophonic realism expected from a grand piano. The piano cover when open, serves to project these sounds even more realistically into the room to give a true concert grand experience! interface. The above drawing was made by simple "under the piano" observations. Interestingly, the mid range speakers are very different in structure from the base tone speakers even though they appear to have the same diameter. 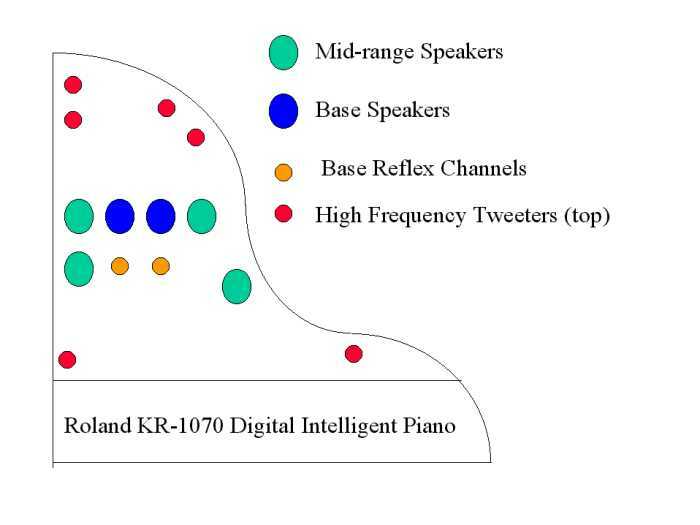 I would be pleased to communicate with experts who know something about the new Roland KR-1070 Digital Intelligent Piano. I think it has a great future, and with the computer age, this represents, to me, the first real breakthrough in true realism for piano sounds! Congratulations, Roland! And a special appreciation to Ikutaro Kakehashi in Japan for founding the Roland Company and promoting advanced research to bring the Company to where it now stands. Domo Arigato!! Click HERE also to learn more about the philosophy of Ikutaro Kakehashi. I would like to express my sincere appreciation to Ron Edelman, owner of Capital Music Center in Austin, Texas, and Britt Cawthon also from the Capital Music Center, for inspiring me to take that leap of faith (and money!) to acquire the Roland KR-1070. Both Ron and Britt have been extremely helpful to me, and to them I owe a debt of gratitude. Please click on CAPITAL MUSIC CENTER and follow this link to Ron's really cool website which was recently launched. You will not be disappointed! 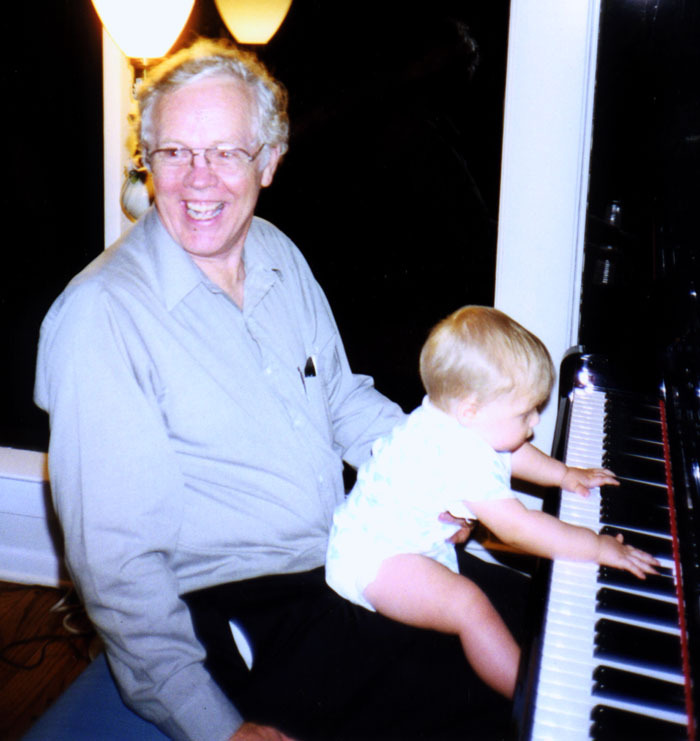 Now, I want you to see the absolutely youngest Roland KR-1070 performing artist, my grandson, Christopher Eric, about 8 months old! Really, he does like to play the Roland KR-1070. Maybe someday he will have the talent to perform great things on this marvelous instrument.